The school year can be hurried and stressful for many parents and their kids. But that’s no excuse to skip out on oral hygiene. Preventive care is essential to maintaining healthy smiles throughout life. 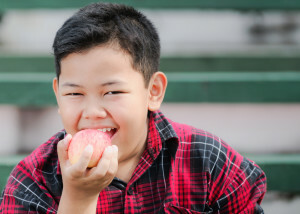 This can be particularly important for children, as they’re prone to cavities due to fragile young teeth and an abundance of sugar in many kids’ diets. While brushing, flossing and professional cleanings are all important, proper nutrition can be a secret weapon in the fight against plaque buildup and cavities. By teaching your kids how to make healthy choices, you can better ensure they spend their lifetimes enjoying great oral health, and beautiful smiles as a result. In the morning rush it can be all-too-easy to reach for convenient items to fill your kids’ lunch boxes, but many packaged foods and drinks are loaded with added sugar. So be careful what you choose, both in the mornings and at the grocery store. With a little prep work the evening before, or on weekends, slicing fresh veggies and packaging them in individual portions can make lunch packing a snap. Consider adding a low-sodium and low-sugar peanut butter or other dip to add protein and fun. Skip the cookies, candy, soda and other sweet treats, and instead add a fresh fruit, which is still sweet but with much more nutritional value. Even many juices are heavy in sugar, so check those labels before purchasing items to pack for lunch. Teaching your kids about the importance of diet to a healthy body and smile can help them make informed decisions. Your children’s dentist can also help by offering tips during regular checkups and cleanings about how to instill in them the importance of oral care.